The 2017 social media challenge has ended. How’d you go? Don’t forget to donate if you haven’t yet. Subscribe here to be notified when the next social media challenge is happening. Or participate in the Reflection challenge. 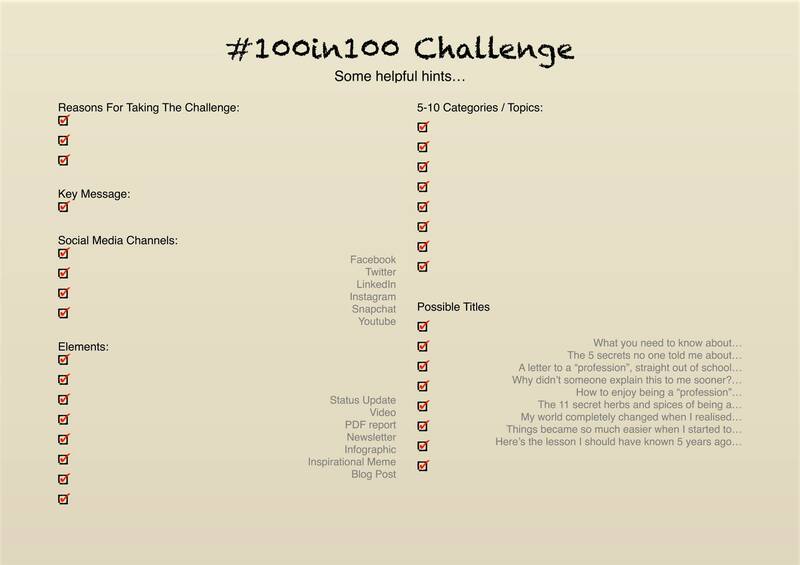 What is the #100in100 challenge? Post 100 posts to your socials, over 100 days and donate $100 to charity. The 100 days will start on 6 March and run till 13 June 2017 (just because). Keeping up with your socials and generating valuable content can be challenging. You’ve got a business to run and/or a life to lead after all. This challenge provides community and accountability to motivate you to form a habit and share a lot of valuable content with your audience. You can post to #100in100 without donating, but you won’t feel great about it. Pick one from below, suggested donation $100 (but anything you can afford is appreciated). All funds are collected directly by B1G1 who disperse 100% of donations to your nominated charity. Starting on March 6, post some content to your socials using #100in100 every day till 13 June 2017. It doesn’t have to be War and Peace, it can be short. Focus on adding value for your audience. What’s your secret sauce for how you do what you do? Your top tips, your best thinking for the day? Most of all, get creative and have fun with it! Support and encourage your fellow challengers. Check out the feed of #100in100 posts daily, schedule it in as a daily reminder or swing by when you have time. Know someone who needs some support in getting their social on? Or who loves supporting a good cause? If you’d like an extra nudge daily, and to hear about updates on the campaign, complete the form to subscribe for reminders. To challenge ourselves to engage more in social media, to share valuable content and to raise money for a worthy cause. Register here, optional donation (suggested $100). Post daily with #100in100 tag. Review the feeds for #100in100 and like what you like, share what you think others will value and comment when you have something to say. That’s ok, just do 80 posts in 80 days, or 30 in 30, or 10 in 10. The idea is to just get in and join in. Go register here. 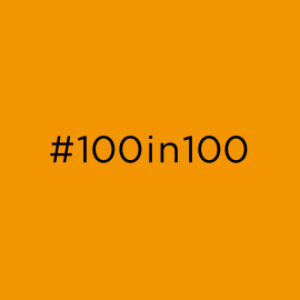 Still use the #100in100 tag so we can find you. That’s ok. Keep going. Post 2 tomorrow if you want. But don’t beat yourself up about it. Likes, shares and comments are optional and we encourage genuine engagement. If you don’t dig it, don’t like it. All donations will go directly to the charity B1G1 to help support the education and health of children in disadvantaged areas globally. 100% of donations are passed on by B1G1 to the nominated causes. We feel supporting the education of children in less-privileged countries to be a worthy cause. Education can be such a lever for them to help them get a step up towards a brighter future. If you would rather donate elsewhere, that’s cool, do it! Then drop us a line and let us know, we’d love to hear what you’re supporting. 100 pieces (small or large) of great content (that you created). I don’t know what to post? It doesn’t have to be hard. It can be as simple as a quote, or an observation. A poem. Whatever is of value to your audience. Think about re-purposing old content in new ways. Turn a quote into an image-quote. Or take an excerpt from one of your articles, or podcasts, or books. Can I re-post old content? Sure. Even better, take a key quote from it, an excerpt, re-purpose it into an image or some audio, get creative! What can I post? How long does it need to be? Anything you would normally post, focus on value for your audience over hard-sell. The idea is to post every day and get into the habit. And get creative, see what others are doing. It doesn’t have to be long, it could just be a quote, an observation, a short post. Preference for original content, but if you run out of ideas for the week, just post a link you value and why you value it. Can I schedule my posts? Ok, I’m posting, now what? Encourage others who are social media savvy to get involved. More participants means a bigger impact we can make together.